Central Idaho is a great spot for a summer trek. Those that make the journey enjoy views of the scenic Sawtooth Mountains, rushing rivers, towering forest, and epic amounts of open space for camping. The high altitude provides for cool summer evenings so there is no need to run your air conditioner. If you find yourself in the area be sure to include a hike to Lady Face Falls. 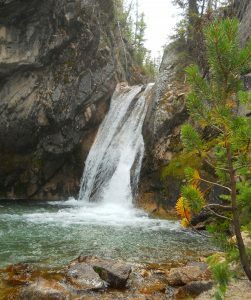 You can enjoy a moderate scenic hike to a beautiful waterfall with opportunities for you and the young ones to splash around during your hike or after at one of the nearby lakes or streams. The trail to the falls is 4.8 miles round trip with only 273 feet of elevation gain, making it suitable for everyone in the RV including the family dog. You can find parking for the trailhead at: N44°14.836 W115°03.959, or if you are at the Stanley Lake Inlet Campground, you can begin the hike from your campsite. Currently a Forest Service pass is not required to park at the trailhead. From the trailhead follow signs to the beginning of the nearby trail. If you are starting from the Inlet campground you will find the trail at the west side of the campground at N44°14.655 W115°03.989. Regardless of where you start your hike the two trails merge together within the first half mile leading you towards the falls. 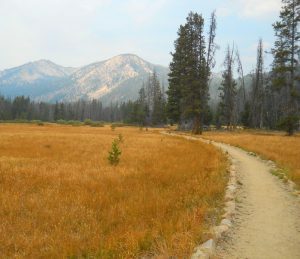 The first part of the trail traverses an open meadow area where you will enjoy views of McGown Peak and surrounding mountains eventually entering a forested area. When the trail starts to slightly climb and circles around to the southeast look for a faint trail and a sign on a tree directing you to the falls. You will find the trail junction to Lady Face Falls at approximately N44°13.858 W115°05.925. Follow this side trail to the falls at N44°13.894 W115°05.758. Keep in mind the falls are not a developed tourist attraction – the area above the falls consists of granite slabs covered in loose dirt and rock with no guard rails. A slip here could be potentially fatal. Be sure children are supervised when approaching the falls. After enjoying the falls, return the way you came. You can choose to park your RV in one of two conveniently located forest service campgrounds or among scores of nearby dispersed boondocking sites. Stanley Lake Inlet Campground provides direct trail access to the falls. Lake View Campground is located less than a mile from the trailhead. 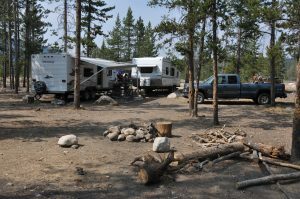 Dispersed camping (boondocking) is allowed on the forest service side roads approaching the campgrounds. Camping is free and limited to 16 days. The free campsite pictured (where friends and I camped) is located at: N44° 15.354 W115°02.508. A little known free attraction and free camping, just another adventure in RVing. Enjoy! We will be in Idaho in Aug near Island Park. May need to swing by this spot.